I am guilty. I am guilty of loading my plate to high, of volunteering for too much, of getting so busy that I forget to pray. This year I am going to be more consistent. Face it. There are a lot of things that need prayer. I have friends waking up in fear and depression. Truthfully, I counted more sad days that happy ones. But God is in control. I thank him that the bad wasn’t so horrid, that tomorrow never came. Yet, I am convicted of forgetting or being too tired to do the one thing I can to alleviate the anxiety that wants to take hold. Prayer. I am going to keep it simple, but I am going to be consistent. I’m ordering a new prayer journal to keep me on this path. Yes, I am not just an author but a believer in the product too. 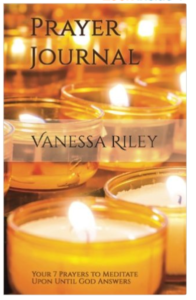 For your free PDF version of the Prayer Journal sign up here. Here is the link to Amazon to order a print copy. Do you have room in your heart for anything else? A new job to help with the bills, a fundraiser to feed the starving children, a sale at your favorite crowded shoe store. Have you stacked your life with carpooling, lil’ Ellen’s ballet classes, and you’re-the-only-one-who-can ministry work, making a buck, oh and quality hubby time between 7:00 and 10:00 on Saturdays, that you’ve lost the meaning of having quality devotion? This year seemed to be one in which many things had finally come to fruition: My novel, Madeline’s Protector is being published. My hubby stopped being deployed, at least for a little while. My firm just signed its biggest client. Then reality came a knocking. Revisions and more revisions to my master piece. (All the edits, including cuts were for the best.) So, now hubby wants me to go to bed at a decent hour. Doesn’t he know inspiration hits at 1:00 A.M. My client believes that they should be my only obligation. It get’s better. Their offices are an hour from my home, and they want this homeschooling principle partner to be onsite early in the morning, three days each week. I won’t mention their lack of understanding of how long something takes to develop and deploy software. So I adjusted, code for reducing my devotion time and being less present with my family. Surely, they won’t mind. I began dropping off/out of my net circles. There was no time to twitter or follow cherished loop threads. Thus, when I needed spiritual refreshment, I pushed away from God and those needed friends offering words of encouragement. Yet, as I seek to get handle on this new normal, tragedy strikes. My younger brother is prepped for open heart surgery in Florida. He lives in Georgia near the rest of the immediate kin. He just visited a client when he started experiencing chest pains. With a torn Aorta, the odds of his survival were less than 25%. The doctor told him without the surgery, he’d die in less than two days. All the cards of my life fell off the table. My hands trembled, and I choked backed tears as I tried to convince our mother that everything was going to be fine. I don’t remember what I said or did next, except speeding away from my ‘not-understanding’ client. I have flashes of begging Delta to let me an oversold flight to be at his side when he comes out of the five hour surgery. While I waited for positive signs of recovery, him waking up, etc., I slept on a hospital couch. My 16th anniversary passed with just phone calls. My child’s upcoming birthday party went unplanned. Nonetheless, my client learned to survive. My book galley edits… Well, I’m thankful for the editing team. The only positive, other than seeing Marc open his eyes and squeeze my hand, was finding time to increase my prayer time. After crying out to God for days on end, I regained that sense of connection. I never felt His arms about me more. Why must it take near tragedy to begin to re-prioritize? I know that others have even more on their plates. I can’t imagine the depths of the burdens each of you have weighing on your lives, the important demands nipping at your heels. All I know, is that you must run and fall at His feet, collapse your weight into God’s warm embrace. Sleeping in the meat-locker cold air in the hospital, sniffing the wonderful bleach-laced alcohol scents in the air, gave me the opportunity to see my life, how much I’d isolated myself from friends and family with the myriad of pursuits I’d packed into my life. First, I must apologize to my friends and family. I’ve been on the edges of your lives, only dipping my head and nodding to appear as if I’m present and involved. Every second that we breathe is precious. Every moment has worth, not just the accolades or project deliverables. I repent for all “my busy time.” God made us to enjoy a Sabbath, every seven days. I’ve made it into a seven-day work week. How can I give my best to my clients or to hubby and my lil’ girl, if my batteries are never recharged? I need to say no. You can’t serve two masters or promise to deliver something that is not humanly possible.We all want to be the good guy, the go-to girl. I am going to have to find joy in slacking. Miss Eager Beaver is now going to be, Mrs. let-me-check-my calendar. It won’t be easy. Maybe there’s a 12 step program for saying no. Lastly, no matter how “important” some deadlines or tasks seem, it will never be more important than finding time to commune with the Lord. He is the lifter of my head when all seems lost. He is the city on hill giving guidance to those stuck in the valley. I don’t ever want to have my heart so full, that I push God and dependence upon him out of the ventricles. My brother is now recovering at home in Georgia. He’s a walking miracle. God has used this circumstance for all our good. Be blessed and say no to all but God. One of my loop friends got a jolt this week, and her openness inspired me. Thanks Rachel. What God has for you, is for you alone. I sit at my low window and draw the curtains open. Every handkerchief is tear-stained, and I seek a breeze to dry my face. But the air is calm and still. Alas, Providence has said no again. The day is bright. The branches of the mighty oak framing my view revels in the shine and casts shadows upon the open panes and my wrung hands. I should be outside with my oils and canvas, capturing the lilies on the pond, the thick greenery of the close heather on my lawn. Yet, my artist’s soul is dour. My paints would be onyx or charcoal. I possess no light today. With a dry spot on my wrist, I scrub my wet cheek. On my lap weighs the heavy letters of Your promises. I’ve no strength to open my Bible, or dump it from my skirts. I’m frozen in regret. What if I said…. What if…. Can any of Your words soothe my restlessness? I know You have plans for me, but what of mine? Did You not know how much I craved the affection? It wasn’t a trifle to me. Did You not care how I set my heart upon this dream? Why let my mind to think, my soul to wish, if I am to be crushed when nothing comes to fruition? Out on the lawn, a furry squirrel chases a rolling stone, no an acorn. As he seizes on the nut, it squeezes out of his paws and scatters to the pond’s edge. Undaunted, the animal makes a dash only to witness his prize tumble away. The acorn doesn’t float. It sinks, rippling the stagnant waters. I am one with the varmint. I turn away from the window. With a deep breath, I declare myself to be reasonable. I should chase a different nut and accept my lot, for You know what’s best. But I am not so easily consoled. I wish to join the squirrel and reclaim the vision gone away, even in the murky depths. My mind resounds with bitter memories, those times I forced my desires. Yet, in the wake of those disappointments, I still want my way now. I’ll admit to a poor track, missteps, but Abba, isn’t today different. Oh, let me be Gideon. My fleece, my face, is still sodden with misery. Therefore, allow me to question Your hand. Did my pleading for this cause, fall away like Abraham’s for Sodom? Was my dream truly so bad? Can you not hear Habakkuk’s anguish in my voice? Have You forsaken me? Is it so, Abba? Is it so? The glazed glass rattles. A soft rush of air billows the gauzy muslin dressing the casement. Constant and steady this wind, this balm of Gilead, covers me. Hints of fragrant lilies and peppery heather fill my lungs, clearing my sniffles. I feel an embrace in my spirit. Thank You for not leaving me. I welcome this no. Scratching noises assault my ears. A few feet away, my friend, the squirrel, has scampered up the oak and dances on a thick limb. His cheeks are pregnant, bulging twice the size of before. He must’ve gathered other acorns. My brethren’s sorrow seems short-lived. Chuckles gather in my throat. A glimmer of my joy has returned. Could it be Sarah’s laugh at impossibility? Yet, it is true. Abba, will You spin all my ashes to gold? I close my eyes and let the breeze stroke my countenance, tickle the bugle beads of my collar. I release more of my pity and woe. Abba, my Father, my Provider, renew my heart to Your plans, Your ways. Ready my spirit to receive your promised provisions. Amen. I hope this helps when God says, “No,” in your life. Even though it is hard, never be in doubt of His plans for your life. Below are some scriptures I use to strengthen my resolve. May they bless you, too. 11For I know the thoughts (plans) that I think toward you, saith the LORD, thoughts of peace, and not of evil, to give you an expected end. 13And the LORD shall make thee the head, and not the tail; and thou shalt be above only, and thou shalt not be beneath; if that thou hearken unto the commandments of the LORD thy God, which I command thee this day, to observe and to do them. Here’s David’s prayer for God to save us and grant us our heart’s desire. 3Remember all thy offerings, and accept thy burnt sacrifice; Selah. 4Grant thee (my plans) according to thine own heart, and fulfill all thy counsel. 5We will rejoice in thy salvation, and in the name of our God we will set up our banners: the LORD fulfill all thy petitions. Finally, for comfort in your sorrow, read of the Bible Hero’s who questioned God and lived.